Vaayan mudra is useful to increase Vata humor.Due to this quality, this mudra also called as Vata-kaarak mudra. 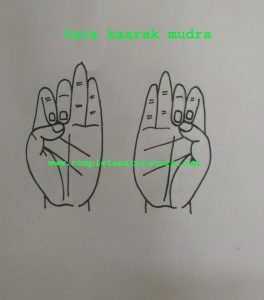 Vata-kaarak mudrais very easy to do, just placing the tips of the index finger and middle finger on the tip of the thumb finger. Vaayan mudra is very efficient in increasing Vata humor.Vata humor plays a significant role in controlling nervous system and various bodily movements.This mudra empowers nerves system and vital power.This mudra helps to overcome Vata deficiency. Nervous exhaustion and the nervous breakdown. Improve enthusiasm, thoughts, and perception. To overcoming lethargy, laziness, debility. Intolerance of heat, sunstroke, excessive thirst, excessive sweating. All the disease caused due to the deficiency in Vata. You can do this mudra at any time or in any position.If is preferred to practice it in the early hours of the morning or meditation. If you are a Vata excess person then do this mudra in moderation only.